To be clear, the MiFID Review is a complex piece of legislation. It is made up of MiFID II, a huge overhaul of the original regulation, because technologically a lot has changed, and MiFIR, an amendment to EMIR, because the launch of the MiFID Review collided head on with the European response to global OTC swap reform. I first looked at how this ‘MiFID-Review-meets-EMIR’ collision was going to play out in a blog from August last year and it’s well worth a quick read as you really want to understand just what’s at stake here. In the bigger scheme of things, the MiFID Review should most definitely now be on your to-do list because the overall scale of it is mind boggling. I say mind boggling from a multi-dimensional perspective. The first dimension being its complexity, the second dimension being its scope and the third dimension being the sheer volume of the legislation itself. Let me explain what I’m looking at. These four key themes impact the buy-side, sell-side and every intermediary-that-I-could-think-of-in-between and will change pretty much the entire marketplace as we know it today. The regulations will need to be worked into any business or operating model that interfaces with dealing or trade processing. In terms of scope the extension of MiFID to all asset classes means that virtually anyone who is involved in financial instruments will be impacted by the regulations and so it doesn’t get much more ‘scopey’ than that! And in terms of sheer volume, the best way that I could think of at looking at this was to compare it with something that we’re already familiar with, so let’s take EMIR, as it’s sitting here right in front of me. When the Level 1 text of EMIR first landed on your desk – the stuff that tells you “what you’ve got to do” – it was 59 pages. Doable. 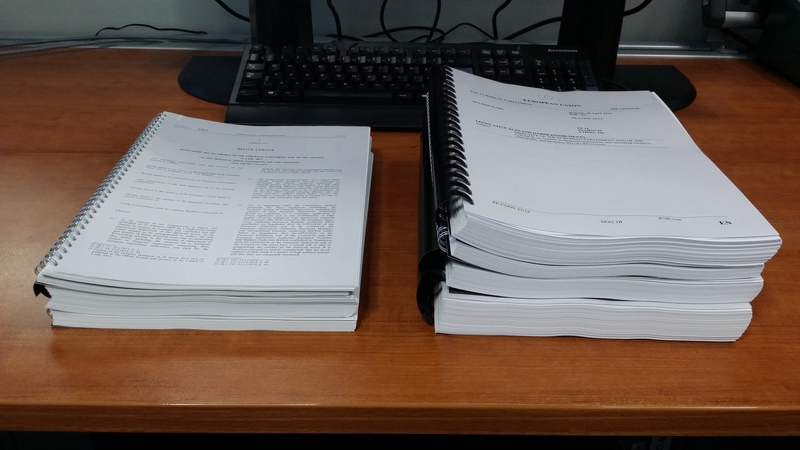 When the Level 1 text of MiFID II and MiFIR lands on your desk, it’s going to be 550 pages! I’m not kidding. Now that we have the Level 1 text, the folks that write this stuff are busy knocking out the Level 2 text – the stuff that tells you “how you’ve got to do it”. When the consultative Level 2 text of EMIR first landed on your desk, it was 368 pages. Challenging. When the consultative Level 2 text of MiFID II and MiFIR lands on your desk, it’s going to be 844 pages! I’m not kidding. Again. No wonder ESMA’ s servers crashed on the day of release! If you have ever been involved in a reg change project, you’ll know that this is complex subject matter and takes real time and effort to work through and that without systematic methodologies for processing all of this stuff, you’re really going to come unstuck. With the compliance date for MiFID II and MiFIR kicked right out to early 2017, I’m sure the easy action is to file this regulation in the ‘low priority’ tray, but given the scale of it, can you really afford to do that? As a Consultant, you get to see the ‘supply and demand’ for implementing all of this stuff and if I can pass on to you what I’ve seen so far, it’s that the more active houses were already mobilising programmes as early as November last year. This entry was posted in EMIR, MiFID II, MiFID Review, MiFIR, Regulatory Architecture, Regulatory Change by John Philpott. Bookmark the permalink.